1Department of Pharmaceutical Chemistry, St James College of Pharmaceutical Sciences, Chalakudy, Kerala, INDIA. 2St James Hospital Trust Pharmaceutical Research Centre (DSIR Recognized), Chalakudy, Kerala, INDIA. 3Kerala Agriculture University, College of horticulture, Vellanikkara, Trissur, Kerala, INDIA. Background: Garlic (Allium sativum L.) is most important spice containing highest sources of total phenolic compounds. It has been used as a component of traditional and modern medicine. Pharmacological properties of garlic is mainly depend on its phyto-constituents content, which varies between geographical regions. The aim of this study was to evaluate and compare the phyto-constituents content of garlic sample collected from high ranges of Idukki (Kanthallur) with that of Tamil Nadu (Mettupalayam market) garlic sample. Materials and Methods: garlic clove sample were collected from high ranges of kanthallur region (GSK) and Mettupalayam region (GSM). The garlic oil was extracted from the collected garlic sample by solvent extraction method. The phytochemical study of extracted garlic oil were conducted using standard methods of analysis and subjected GC-MS analysis. Further, the extracted oil samples were studied for their anti-tumour activity against Dalton Lymphoma Cell Lines (DLA) in an in vitro model. Results: The obtained results revealed that garlic oil of GSK showed highest percentage of yield of oil (1.1%) than garlic oil of GSM (0.6%). The phytochemical screening of GSK indicated the presence of alkaloids and flavonoid, whereas GSM showed presence of alkaloids only. GC-MS analysis of garlic oil study indicated that garlic oil of GSK was found to have eugenol as a novel source compared with garlic oil of GSM. Garlic oil of GSK showed significant anti-tumour activity against DLA cells, compared with garlic oil of GSM. 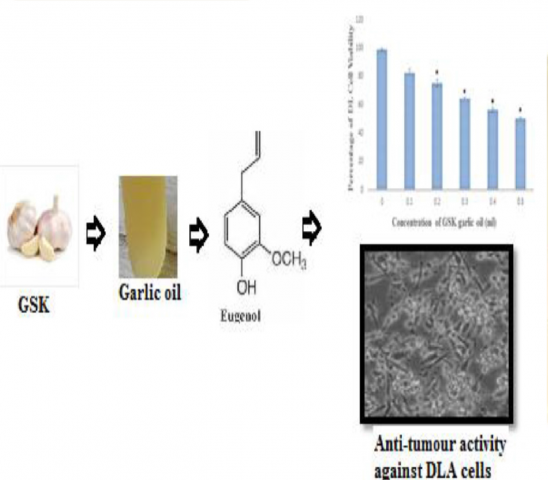 Conclusion: Garlic oil of GSK exhibited potential anti-tumour activity against DLA cells due to presence of eugenol compound as novel source. Antony S, Kumar KK, Menon JS. Assessment of Phyto-Constituents by GC-MS and Anti-Tumour Activity of Garlic Grown in Different Altitude: A Comparative Study. Pharmacognosy Journal. 2019;11(2):350-354.